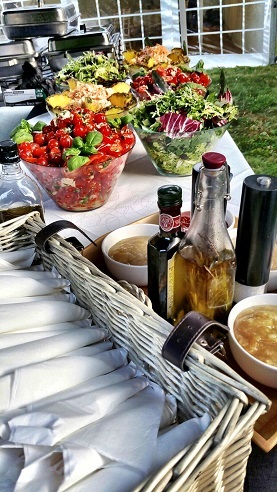 If you are planning a party, the Spitting Pig Devon team would love to provide the food for you. We have many years of experience, so when you hire us you know you are going to get great food that tastes great. Whatever kind of party or event that you’re organising, Hog Roast Torquay can provide delicious dishes to suit all tastes and dietary needs, and that doesn’t stop at sides and alternatives. Whether you fancy a posh menu, with several courses served, including sit-down courses and a buffet hog or spit roast and a drinks service, or a simple, informal barbecue or our pigs in buns served and nothing else, we have the capabilities to cater anything you’re thinking of, and in the way that you want it done. Our professionally trained chefs offer a huge range of foods, so you know that the tastes and dietary needs of all of your guests will be catered for. Everything is prepared on site to make sure that it is fresh, cooked to perfection and tastes great. At Spitting Pig Devon we specialise in catering for big events, but we welcome orders from people who are hosting small family get-togethers. The modern spit roasting machines that we use allow us to cook any meat. Whether you want a full hog roasted or a spit full of chickens, hams or turkeys we can do it. You tell us how many people you are catering for, what meats you want to be served, we then work out the amount you need and cook it for you. We can also provide a range of dishes for you to have served alongside the meat. Just visit our menu page to see the list of salads, sides, stuffing, gravy, sauces, canapés and desserts we offer. These dishes are inspired by the cuisines of the world, so you are bound to find plenty of food for your guests will enjoy. In terms of alternative options, Hog Roast Paignton will make sure that all of your guests are able to eat and enjoy our tasty food, as long as you give us advance notice. We have vegetarian and vegan dishes like veggie skewers, stuffed mushrooms and peppers and burgers, and gluten-free guests can even enjoy our delicious pigs in buns, as all we need to do is bring along suitable bread rolls, as everything else is already suitable. Cooking the meat yourself is a good way to impress and delight your guests. A whole hog or a row of turkeys turning on a spit is a spectacular sight. Modern spit roast machines make it easy for amateur chefs to cook in this way. A member of the Hog Roast Devon team provides the training you need to get perfect results every time. If you want, we can deliver the machine with your choice of meats already loaded onto the spits. All you need to do is to turn it on and occasionally check it is cooking evenly. 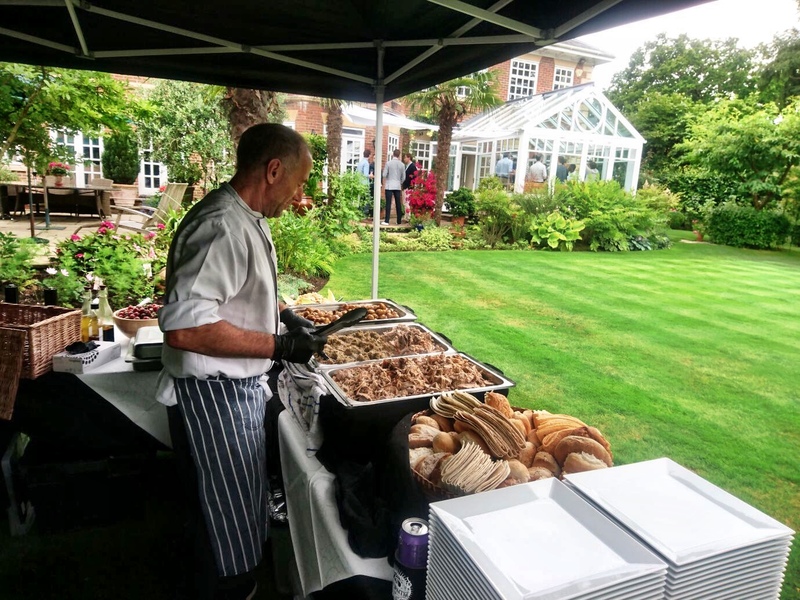 Both Hog Roast Torquay and Hog Roast Paignton can provide the food that you want and need for your event or party, and at a price that you may well be surprised at. 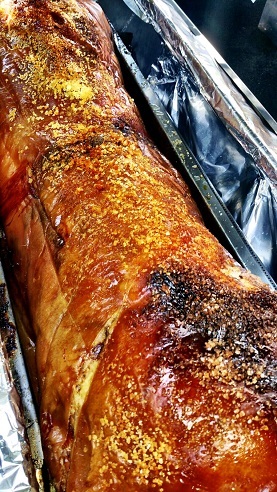 If you’re thinking about having one of our fantastic centrepiece hog roasts featured at your social occasion, we can cook up a storm and make your guests’ mouths water and taste buds tingle, and the juicy meat and salty crackling will certainly both amaze and satisfy. So, if you want wonderful food for a great price please get in touch with us. All you need to do is to choose some dishes from the menu, tell us how many people you are inviting and ask for a quote. Spitting Pig Devon are proud to say that we only use locally sourced free range pigs and the freshest of ingredients to create the highest standard and by far the best tasting hog roast in Devon. We can cover most areas across the South-West, including Devon, Plymouth, Paignton, Torquay and beyond. With plenty of notice, we are usually able and happy to travel much further. So please contact us to discuss your requirements.